In 2008 the General Council of the Society moved from Ireland, where it had been located since our beginnings in 1918, to Hong Kong. This vibrant city is close to many of the countries where our missionaries are working. The General Council, from left, Fr. Joseph Kang, Alvaro Patricio Martínez Ibáñez, Fr. Tim Mulroy, Fr. Brian Vale. Fr. Mulroy is a native of Meelick, Swinford, County Mayo, Ireland. Following his ordination, he served in Japan from 1995 to 2002. In 2002, he moved to the United States and was named Director of Formation at the Columban International Semenary in Chicago, Ill. Fr. Mulroy served in Chicago for nine years. In 2011, he served in parish ministry at St. Pius X Church in El Paso, Texas. Fr. Mulroy was elected U.S. Regional Director in November 2012, and remained in that position until he was elected Superior General for the Society in 2018. Fr. Vale was born in Plymouth, New Zealand. Following his ordination, he did parish work in Japan and was appointed Justice and Peace Coordinator for the Japan region in 1981. In 1985 he went to the United States to do training for Spiritual Direction in Chicago, Ill. In 1986, he was appointed to St. Columban's College in Sydney, Australia, serving as Spiritual Director from 1986 to 1991. In 1992 he returned to Japan, serving in Tokyo. He was appointed Regional Director of Japan in 1994 and served in that capacity until 2000, then worked in Japan until 2003. Fr. Vale was appointed Superior of New Zealand Columbans at Lower Hutt in 2003 and served there until 2009. In 2009, he took an appointment witht he columban Mission Institute in Sydney. In November 2017, Fr. Vale was appointed the Regional Director for Australia/New Zealand and held that position until being elected Vicar General. Fr. Alvaro was born in Chile, the youngest son in a family of 10 children. Following his ordination, Fr. 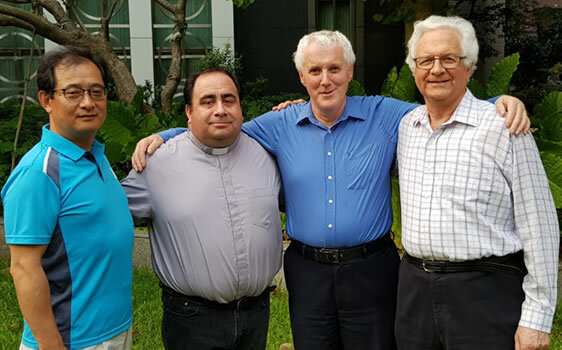 Alvaro served as co-ordinator for vocations and headed up the formation house in Chile. In May 2011, he was appointed Regional Director for Chile and remained in that position until being elected Councillor. Fr. Kang, a native of South Korea, studied theology in Maynooth, County Kildare, Ireland. Following his ordination, Fr. Kang in Peru for six years. He was named Vice-Director in Korea prior to being elected General Councillor.